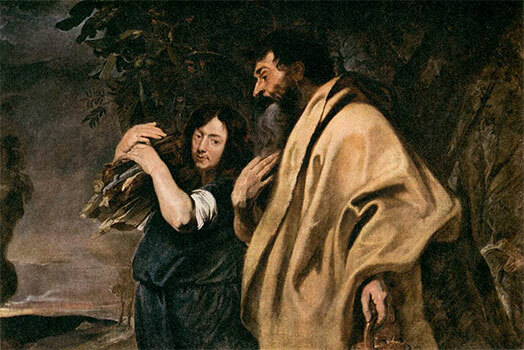 Abraham and Isaac by Anthony van Dyck, c. 1617. In his old age, Abraham was promised a son not only to continue his family name but that through him he would become the father of nations. To the ancient mind, and especially in these circumstances, to give up his son would have meant to be asked to give up this promise. To lose his son would have been to lose himself. Ancient people for better or worse intuitively understood that the only authentic sacrifice to God, to whom we owe our life, would have to be precious enough to represent our entire lives. But God does not want the spillage of the blood of Isaac. He wants our faith, gratitude, and obedience, which is why He provides a substitute of a ram to stand in Isaac’s place, to symbolize that which is so precious as to represent our very selves. Though Abraham offered his mortal son up to God, the Lord held back the hand of Abraham for He knew a far better sacrifice was to come. God knew that one day He would give up His only begotten and immortal Son as a sacrifice for all of us. Both Isaac and Jesus willingly were bound for the sacrifice. And they both carried the wood for the sacrifice up Mount Moriah, which would be later known as the location of the temple in Jerusalem (cf. 2 Chronicles 3:1). As such, in making the distinct act of preparing for the sacrifice, they both act as victim and priest. 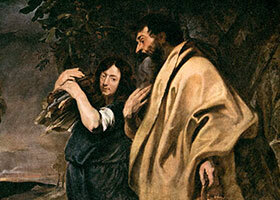 However, unlike Isaac, Jesus approached freely and with full knowledge of what the sacrifice would require of Him. Also, unlike Isaac, Jesus did in fact brave the pangs of death and accomplished the sacrifice. God returned Isaac to Abraham in fulfillment of the promise of God, whereas Jesus resurrected from the dead and in so doing stands eternally as our High Priest. Callie Nowlin, MTS, is the Director of Religious Education for Immaculate Heart of Mary Parish in Abbott and Nativity of the Blessed Virgin Mary Parish in Penelope.